UK BASED FTR's exciting Ron Haslam tribute Moto2 racer is to sell for £69,850 (£82,073 including UK VAT) but excluding delivery, Visdown can reveal. The limited edition production run of just 10 hand-built racers will be built to the exact specification as the firm's Moto2 machines due to take part in the inaugural Moto2 series, when the 2010 World Championship kicks of on Sunday 11th April, at Losail circuit, Qatar. Bespoke footrests, foot levers and handlebars produced bespoke to the rider so it is preferred that the rider visits the FTR factory for fitting. Race developed parts available to all customers. Development will be based on all feedback and data received from World, Spanish and German Championships and will be incorporated in the FTR UK test and wind tunnel schedules. Technical support available at all times direct with FTR Moto factory, free of charge. Support is direct with FTR Moto R & D engineers. FTR Moto engineer available for trackdays, tests and races. Option of alternative components if required. This machine is 100 per cent FTR Moto design and build, all parts unique to FTR Moto. • Three days of track tuition and machine set-up advice from Ron Haslam. • A celebratory dinner, presentation and evening with Ron Haslam. • An Arai Quantum Ron Haslam replica crash helmet, bespoke fitted. • A Spidi Elf Honda replica set of GP Kangaroo leathers, bespoke fitted. • Matching Spidi gloves and XPD boots. • A framed presentation of the Elf Honda/Ron Haslam 500cc Grand Prix years. • A limited edition print of Ron Haslam and the Elf Honda. 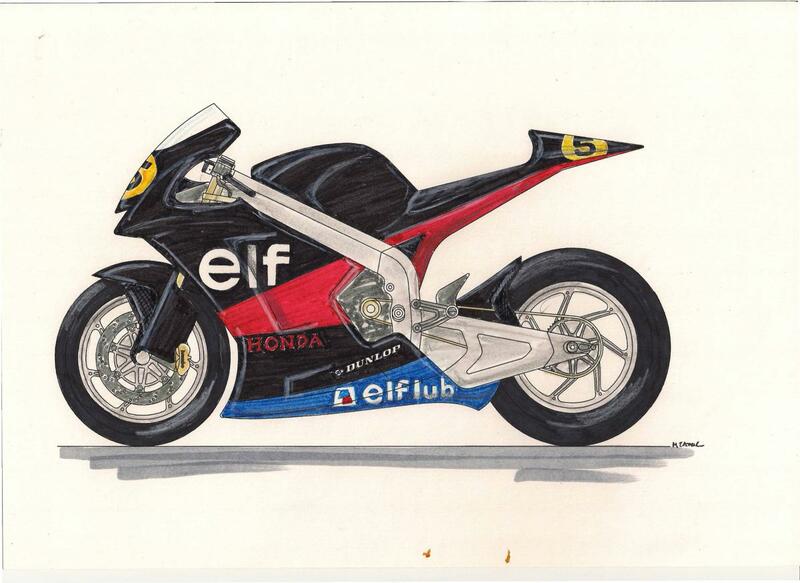 • A range of gifts to commemorate the Elf Honda/Ron Haslam and FTR project. • A presentation book explaining the background to the project’s partners. • Briefings with all involved; FTR, Chris Mehew, Ron Haslam etc. after the presentation of the machines to the clients. Type/detail: FTR Moto aluminium twin spar. FTR Moto design, fabrication, machining and finishing. FTR Moto fully adjustable headstock and insert for angle, position. All controls; handlebars, footrest assemblies bespoke to rider. Type/detail: FTR Moto triple clamps: option of 24, 27 and 30 offsets. FTR Moto bespoke front axle assembly and spindle. Type/detail: FTR Moto aluminium bespoke design and construction. Integrated rear stand locator and fixing. FTR Moto bespoke chain adjuster assembly. FTR Moto bespoke self-aligning rear spindle assembly. FTR Moto pivot adjustment system. Type/detail: FTR Moto bellcrank plate and link design. Manufacturer/type: Ohlins race-specification forks and rear damper. Front: 750mm upside down forks telescopic with 130mm travel. Rear: 302mm rear unit with 65mm travel. Type/detail: FTR Moto bespoke aluminium. Front: XA3.J7 50/51 machined four-piston calipers. 290mm x 5mm disc x 2. Rear: XA1.JO.40 machined twin-piston caliper. Type/detail: FTR Moto bespoke design and composite construction. Stressed seat with seat top panel options. Tank/airbox cover, front and rear guards. Radiator ducting, air intake and dash mount. Manufacturer/type: Full World Supersport spec. Honda CBR600RR. STM Race clutch, generator and Nova gearbox. Manufacturer/type: FTR Moto radiator and specification. Aluminium water pipes using Wiggins connectors. Manufacturer/type: Titanium race Arrow / FTR Moto system. Four into two into one. FTR Moto Integrated rear wheel lift system. Data-logger: HRC (2D system supplied if required). McGregor: The Long Way Hound? "More at risk from gamers than outlaw motorcycle gangs"